Here's a crazy thought: The Houston Texans with home-field advantage throughout the AFC playoffs. Yep, the team that began the season 0-3 just might sneak past the Chiefs and Patriots and claim that coveted spot. The Texans have won nine in a row. They've done so in all sorts of ways, from strong defence to opportunistic offence to solid special teams to superb coaching. On Sunday, they face Indianapolis (6-6) and can pretty much knock the Colts out of post-season contention with a win. Indianapolis has won three of the past four against the Texans in a series in which the past eight games were decided by seven or fewer points. Should Houston get by the Colts, the remainder of the schedule has visits to the Jets and Eagles and a home finale against Jacksonville. Considering that two-month string of wins, why can't the Texans run the table? "It's a small accomplishment," says defensive end Jadeveon Clowney, who has justified being the top overall pick in the 2014 draft. "We still haven't even won the division with winning nine in a row, we have no playoff spot, nothing right now locked up. "So, it's a small accomplishment, but hopefully it will lead to bigger things for us. We're playing for much more than just the division right now. We're trying to play for first, second, third seed, whoever is ahead of us right now." That would be Kansas City (10-2) and New England (also 9-3). Both have a more testing December. "I think it's when you start to look ahead, or you start to get overly excited about accomplishments that, not don't mean anything, but winning nine in a row, winning a division, you take things one day at a time," J.J. Watt adds. "I think that's the biggest mentality I've taken away from it all is just control what you can control. If you try to start controlling things that you can't control, then you can get in trouble. The weekend began with Thursday night with Tennessee's 30-9 home victory over Jacksonville. Derrick Henry sped and stiff-armed his way to a record-tying 99-yard touchdown run for Tennessee (7-6). Henry tied Tony Dorsett's 99-yarder on Jan. 3, 1983, for Dallas against Minnesota for the longest TD run in NFL history. Henry set a franchise record with 238 yards on just 16 carries, topping the previous mark of 228 yards set by Chris Johnson in 2009 against yes, the Jaguars. Henry finished with a career-high four TDs, tying Lorenzo White and Hall of Fame running back Earl Campbell for most rushing TDs in a single game in franchise history. The Saints take the NFC South with a win or a Carolina loss. They're eager to get back on the field after their worst performance of 2018, a Thursday night loss at Dallas in which they were overwhelmed by the Cowboys' defence. Tampa Bay, which has gained more yards on offence than anyone -- yes, even New Orleans -- won the first meeting to open the season. Then the Saints won their next 10 games. Bucs quarterback Jameis Winston has not turned over the ball since regaining the starting job two weeks ago. In the past three games, one in relief, Winston has completed 61 of 84 (72.6 per cent) with six touchdowns and one interception for a 119.1 rating. The Rams already own the NFC West title. They earn a first-round playoff bye by beating the Bears. This is an intriguing matchup, LA's second-ranked offence against Chicago's No. 4 defence. The Bears are second stingiest against the run, and the Rams' Todd Gurley leads the NFL in both yards rushing (1,175) and yards from scrimmage (1,649). Chicago's defence leads the NFL with 21 interceptions and will test Jared Goff. Chicago hopes to have regular quarterback Mitchell Trubisky back from a shoulder injury that cost him two games. He'll need to watch for Rams DT Aaron Donald, making a strong statement for a second straight NFL Defensive Player of the Year award. He tops the NFL with 16 1/2 sacks, has at least two in three straight games. A Patriots win -- this is one place they don't like, having lost four of the past five at Miami -- means yet another AFC East crown, 10 in a row. Tom Brady has won 12 of his past 13 starts within the division. He's also ready to establish another NFL record: Brady has 579 career TD passes, including post-season, tied with Peyton Manning for the most. New England also has found a rushing defence, not allowing a 100-yard gainer since Week 3. Miami has been outgained by 1,168 yards and is on pace to break the 1967 team record yet is in wild-card contention. The Dolphins do rank third with 25 takeaways. Two AFC division races involved here. The Ravens have crept within a half-game of the Steelers in the North, but they have a massive challenge at KC while Pittsburgh shouldn't struggle much at lowly Oakland. Beating the high-powered Chiefs at Arrowhead calls for a monstrous defensive showing, and Baltimore has the top-ranked D. It also has a clock-killing run game with rookie Lamar Jackson at QB: The Ravens have had at least 200 yards rushing in three straight weeks. Still, Kansas City is 5-0 at home and leads the league in scoring at 37 points a game. Patrick Mahomes has a league-leading 41 TD passes and 43 throws of 25-plus yards. Kansas City, which gets a playoff berth with a win, can't afford a stumble with the Chargers one game back; they meet next Thursday night. With Cincinnati in a rugged, injury-caused slump, LA could romp Sunday. The Chargers have a few complicated ways of getting at least a wild card this week. Philip Rivers has thrown two or more TDs in each of his first 12 games, tied for the third-longest streak to begin a season in NFL history. Rivers has 10 TDs and six INTs in six games against the Bengals, who have won four straight meetings in the regular season. The Raiders have won the past three home games in this series since losing in 1995 and the Steelers are 3-8 all time in Oakland. Still, unless they hand things to the Raiders, they should win even without standout RB James Conner (ankle). Whoever emerges here has an inside track to a wild-card berth, though the Vikings still think they can grab the NFC North title. Seattle is exceptional in prime time: 24-5-1 since 2010. Russell Wilson has 29 touchdown passes and five interceptions through 12 games. He has thrown at least two touchdowns in eight straight outings and has 16 touchdowns and two interceptions in Monday night games. Plus, the Seahawks are leading the NFL averaging 148.8 yards per game rushing. But Seattle has been inconsistent defending the pass, and Kirk Cousins tops the league with 350 completions. Adam Thielen leads the NFL with 98 catches, is second in yards with 1,166, and tied for fifth in TDs with nine. Thielen and Stefon Diggs are the only pair of teammates in the NFC with 80 or more receptions. A Cowboys victory gives them control of the NFC East; they won at Philly earlier this season. Dallas has won four straight and comes off that impressive victory against the Saints, followed by a nice rest. Eagles TE Zach Ertz has already established a single-season franchise record with 93 receptions He's 18 away from breaking Jason Witten's NFL record for TEs. Remember Mark Sanchez? He's now the Redskins' starter with both Alex Smith and Colt McCoy out with broken legs. It's his first start since 2015, and the Redskins are a banged-up bunch everywhere. New York, which lost star safety Landon Collins (shoulder) for the rest of the season, has won three of four since its bye. RB Saquon Barkley and WR Odell Beckham Jr., are having big years despite a leaky offensive line. Most interesting storyline is Joe Philbin taking over as Packers coach and calling plays for the first time in his pro career. Aaron Rodgers has thrown a franchise-record 336 attempts without an interception, trailing only Brady (358 in 2010-11) for the longest such stretch in league history. Linebacker Deion Jones had a career-high 15 tackles and one sack last week, returning after missing 10 games while injured. But the Atlanta defence is 31st against third downs (51 per cent). The Broncos have awakened with three consecutive victories. But they have one road win in the past 30 seasons vs. the 49ers. They lost top wideout Emmanuel Sanders in practice this week with a torn Achilles tendon. San Francisco's five takeaways are the fewest through 12 games since at least 1940. The previous low was seven for Jacksonville in 2016. A four-game slide has seriously endangered the Panthers' playoff chances. Their passing game has struggled and now Cam Newton has a sore right shoulder. He was picked off four times last week. But they're averaging 140.8 rushing yards per game, only behind Seattle's 148.8. Coach Ron Rivera fired D-line coach Brady Hoke and assistant secondary/cornerbacks coach Jeff Imamura. 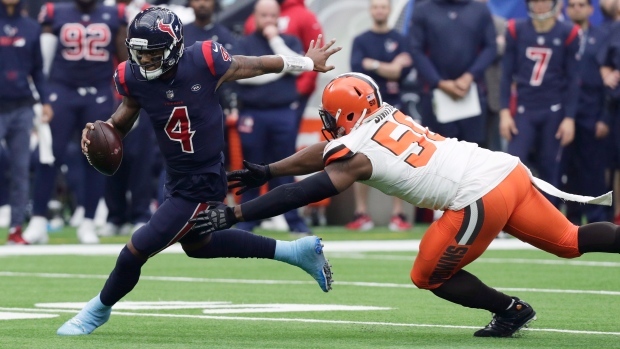 Top overall draft pick Baker Mayfield threw three interceptions in the first half in a loss at Houston to dampen some of the enthusiasm in Cleveland. The Browns lead the AFC with 27 takeaways. It looks as if Sam Darnold is recovered from his strained right foot, setting up a matchup with fellow first-round selection Josh Allen among rookie QB prospects. Darnold has a 3-6 record and has thrown a league-high 14 interceptions. Allen has 391 yards passing, three TDs and two interceptions, and 234 yards rushing and a TD in his past two games since missing four with a sprained right throwing elbow. The Lions have lost eight straight at Arizona, their last win coming in 1993. Plus, Detroit is 0-3 against the NFC West this season. Cardinals WR Larry Fitzgerald needs one catch to move ahead of Jerry Rice for the most receptions for one team in NFL history. Fitzgerald needs one TD catch to match Antonio Gates for sixth on the career list.